They're heeeeere!! Luminas, Baby Boos and other white pumpkins have invaded local grocery stores. 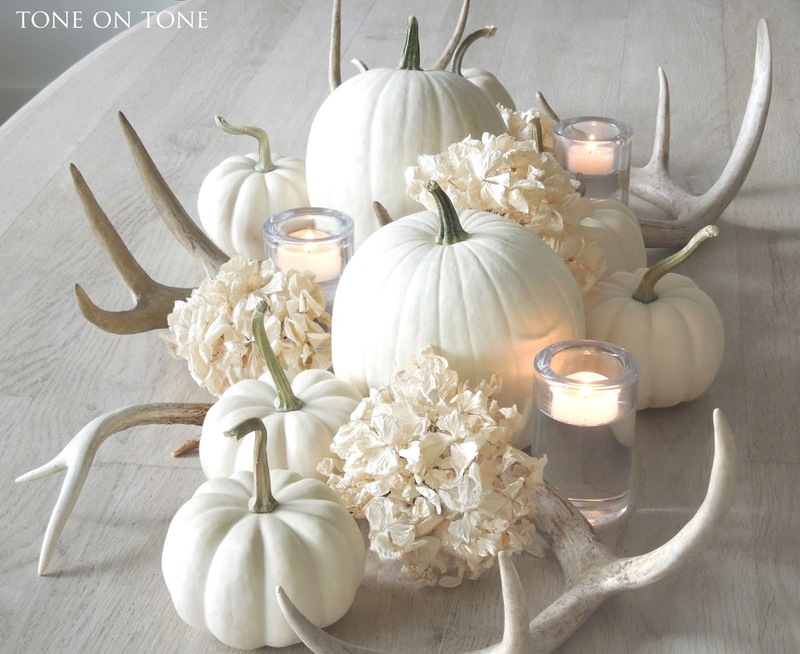 While it is still somewhat warm to fully dive into fall decor, I just couldn't resist these ghostly beauties. 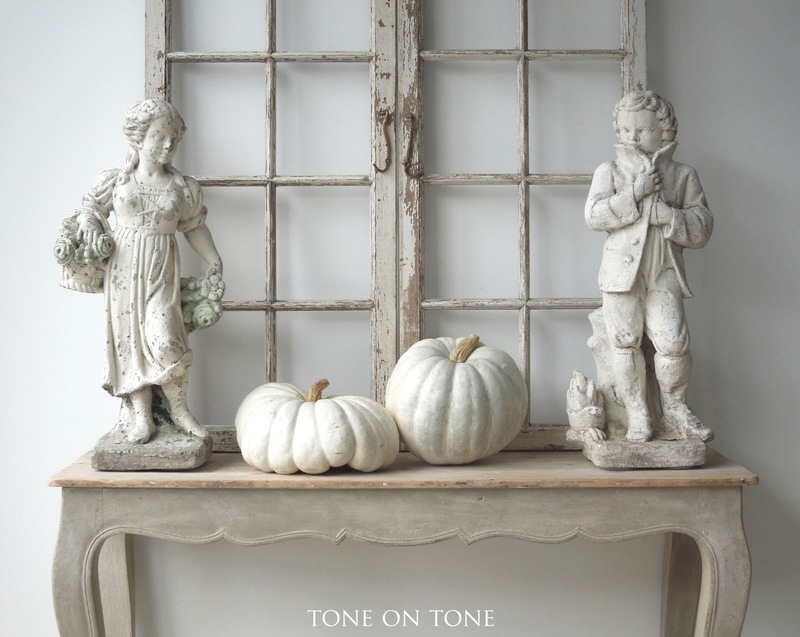 With their pale patina and autumnal form, they are the perfect accent to transition from summer to fall. 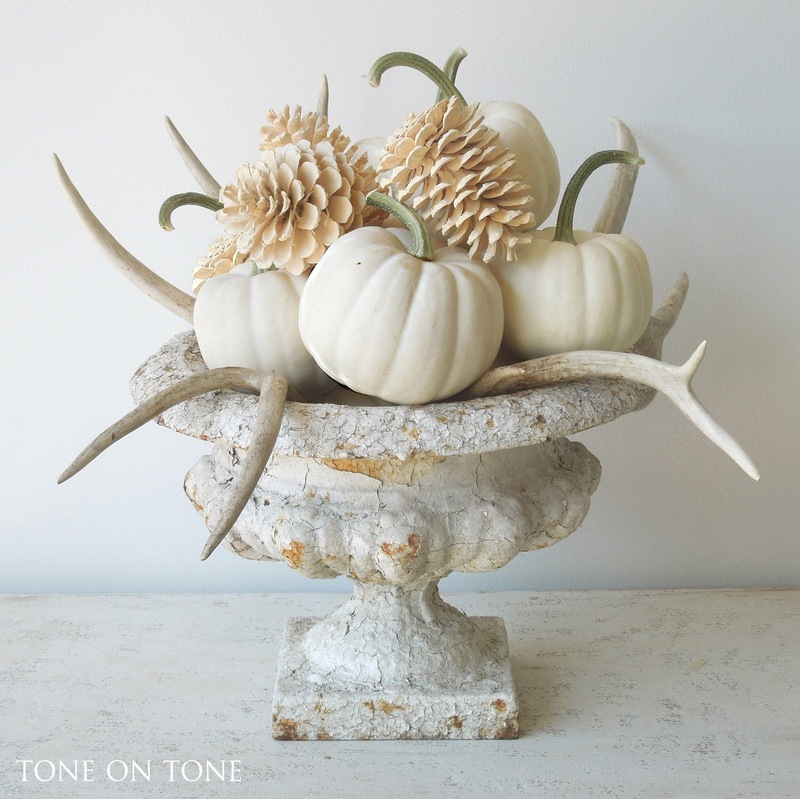 At Tone on Tone, we are once again celebrating the arrival of fall with subtle inspiration from nature. 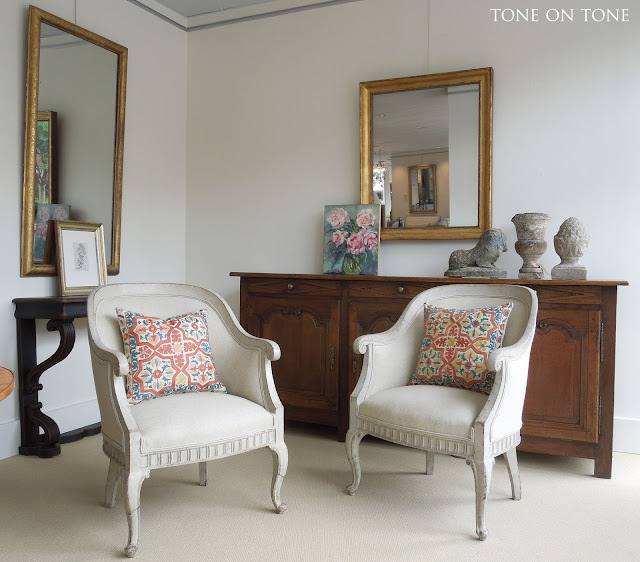 Enjoy this preview, and stop by to see much more. 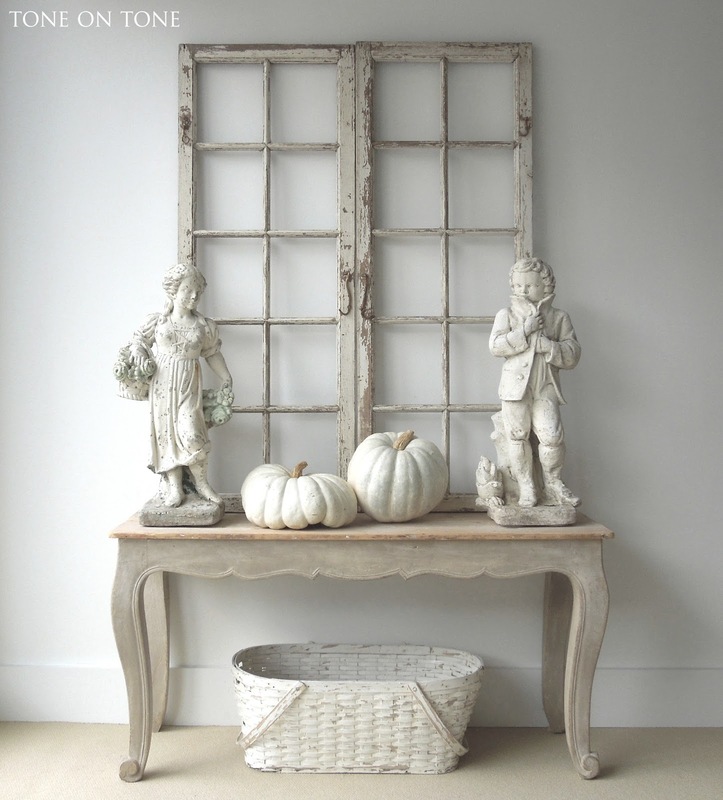 The arrangement sits on an antique French chest, but it would also look fabulous as a centerpiece on a dining or center table. It's interesting from every angle. 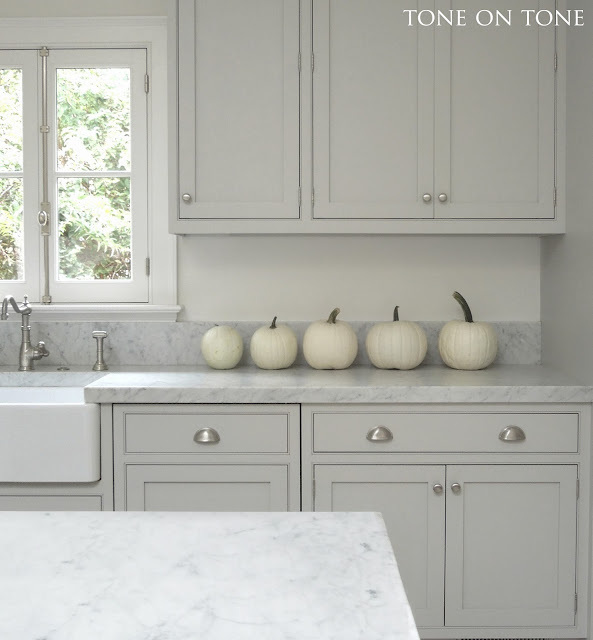 And because it is low, it won't block the line of sight of dinner guests. Here is our gleaming "great wall of china" where I like to display the shop's collection of antique white ironstone. 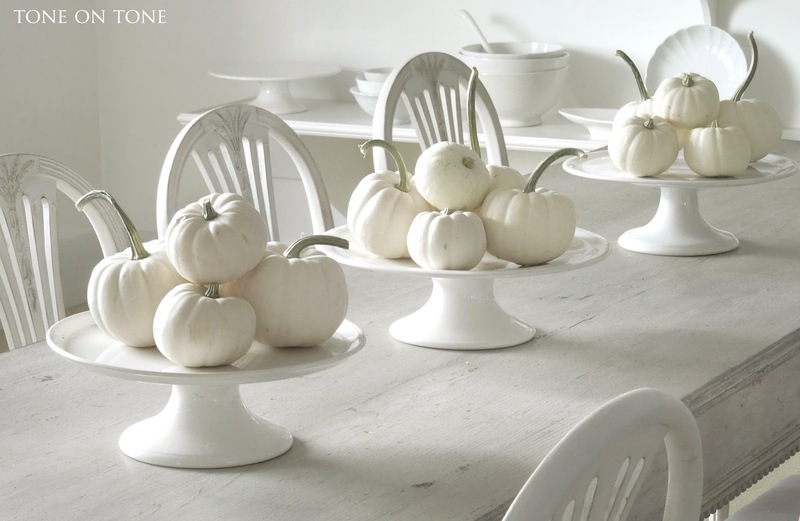 On top of this Continental 9' long, narrow table, I casually placed three footed cakestands with piles of Baby Boos. 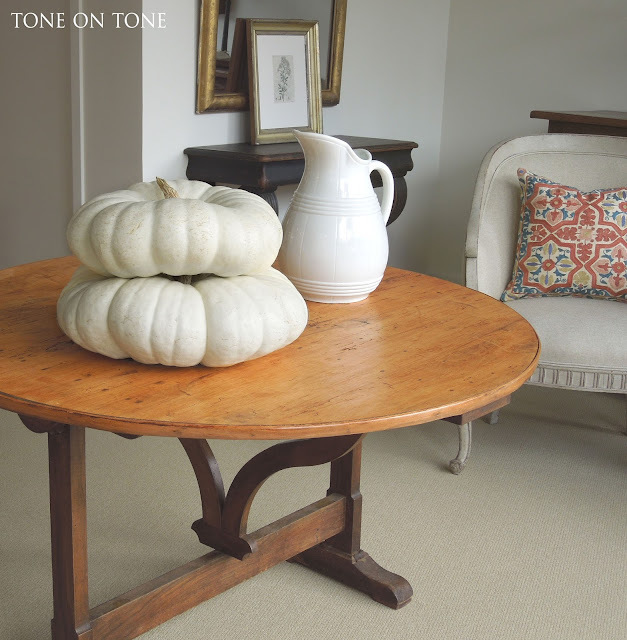 To dress it up, a homespun linen runner underneath the cakestands would look smart. BTW, cakestands make everything, not just cakes, look more special. So elevate your fruits, pies, cookies as well as quiches to new heights! 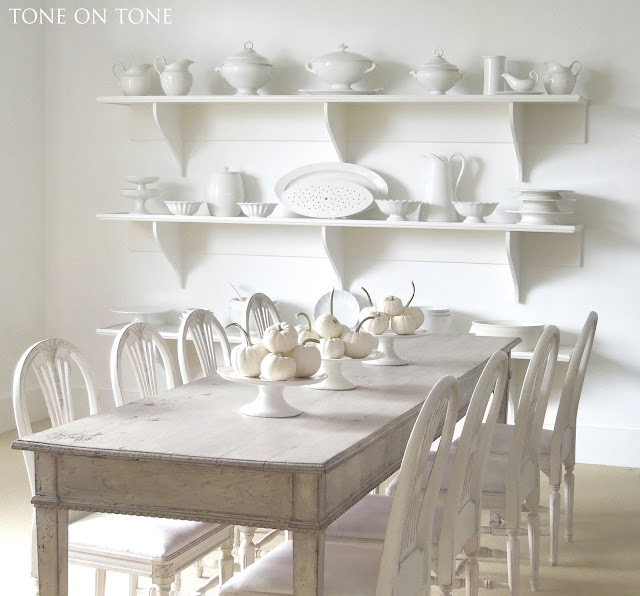 From soup tureens to serving platters, our white ironstone pieces are ready for your dinner parties. 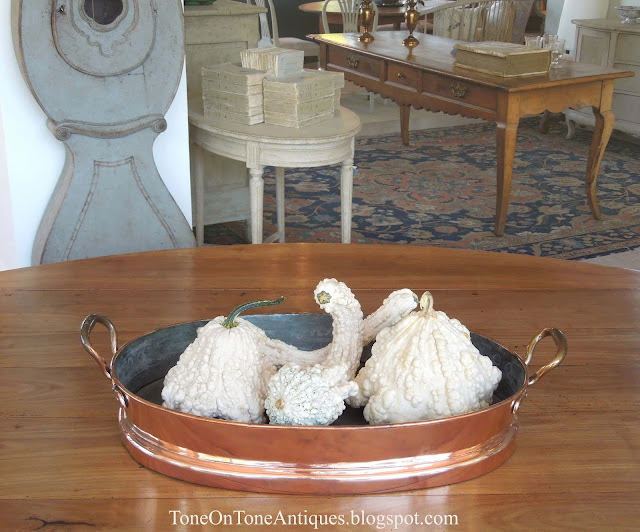 Note the large oval fish platter with its original drainer in the center of the second shelf - quite scarce to find the set intact. The three footed stands on the far right were made for serving cheese; these are typically lower than cakestands. Look at these two large, flat White Boer beauties! They are sitting on a French round tilt-top vendage / vineyard table that would have been brought out for special wine tasting occasions. At 46" diameter, it would make a lovely breakfast or center table. Here are some fresh arrivals just in time for fall. 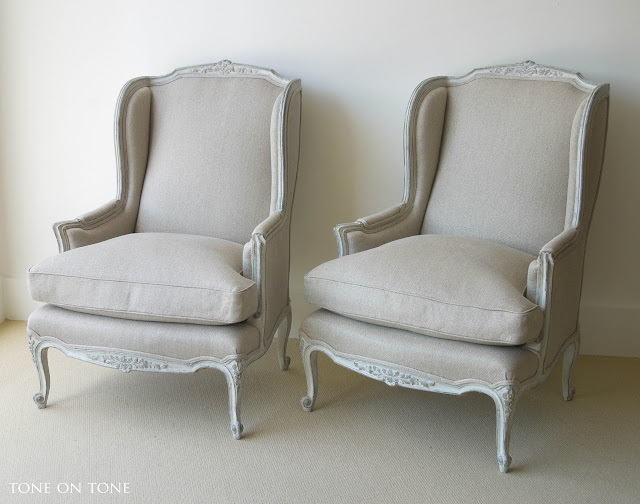 A pair of newly upholstered Swedish barrelback chairs with unusual form - taller plus slightly larger than the typical Gustavian ones. 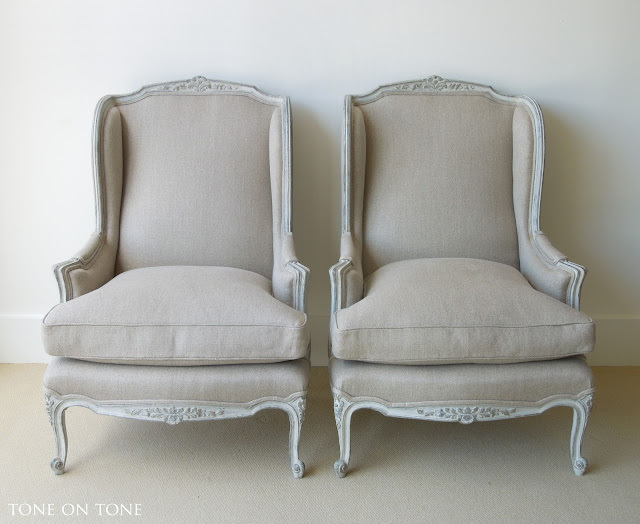 They are sculptural, handsome and comfy, too. 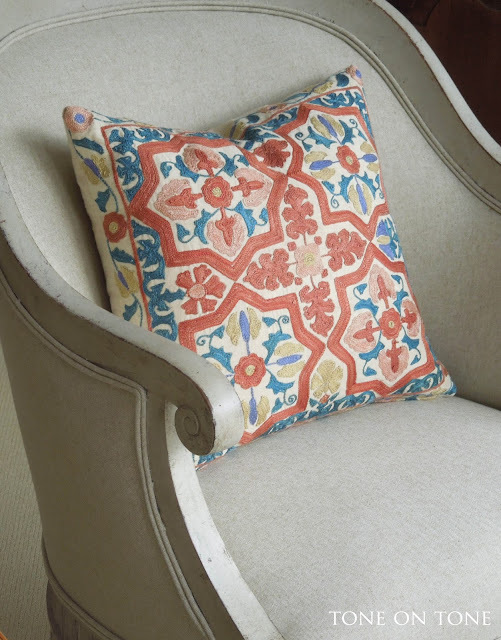 These striking pillows are made with antique embroidered textiles. 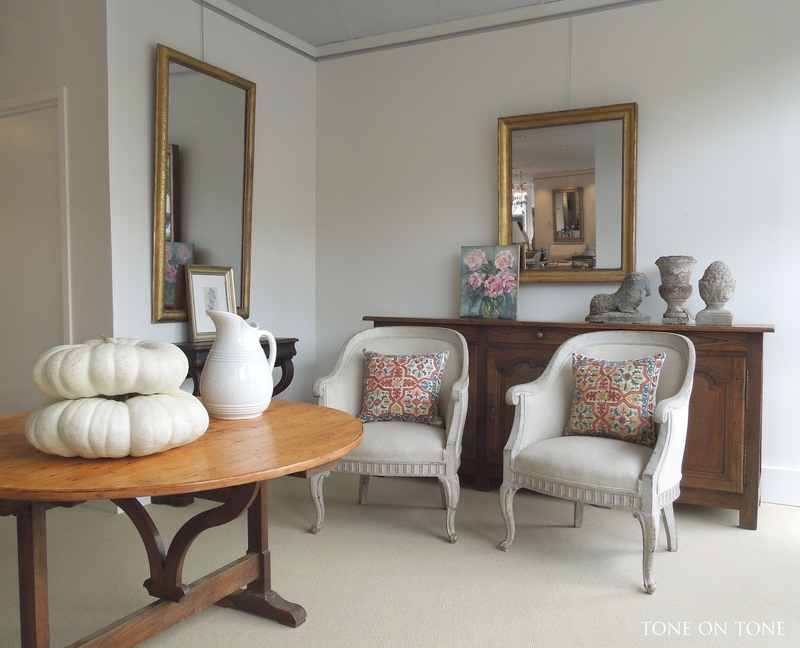 Both the azure, in that shade of sky found on clear autumnal days, and rich terracotta bring the splendor of autumn inside. The ground color is tan. 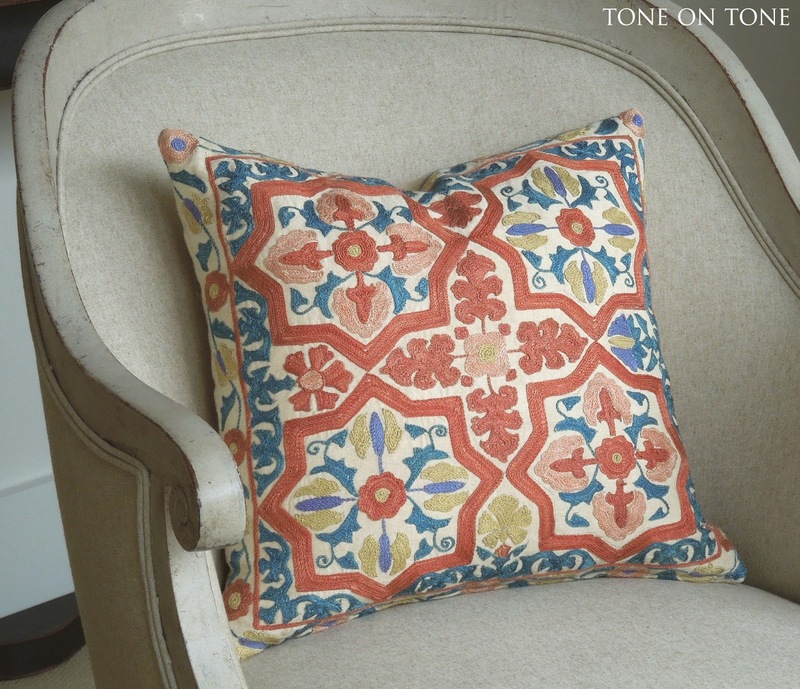 Speaking of pillows, I couldn't resist this fun, fuzzy one in teal - there is something very lux about Mongolian lamb. It makes our pair of antique French wingback chairs, with new Belgian linen and down filled cushions, even more inviting. For the cooler nights ahead, cozy wingback chairs are must-haves! Our pair is beautifully and simply carved without all the fussiness. 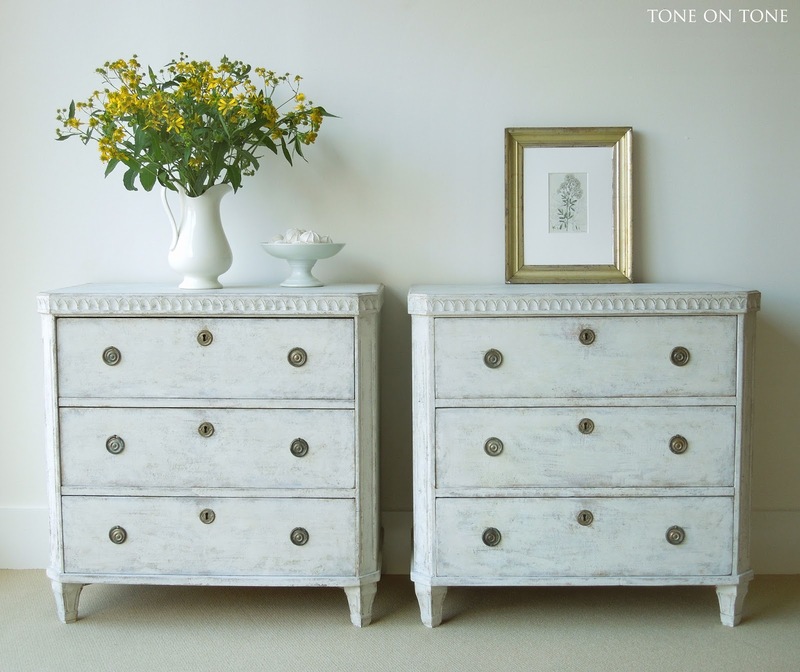 This pair of antique Swedish painted chests is another new arrival. They have all the classic Gustavian elements: leaf-tip carving, fluting, clean lines and that chalky finish. Please visit us at the shop or online to see additional new arrivals. We'll be adding more to the website soon. Now a throwback to a few of my favorite fall moments from our shop and home. 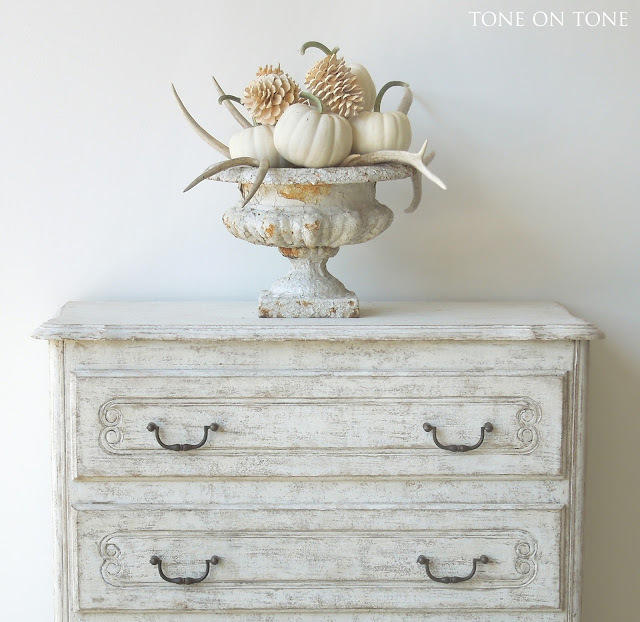 A vignette featuring pieces with pale patina. The garden statues of spring and winter are available here. Lining up the Luminas after a thorough washing in our former kitchen. Warty gourds! 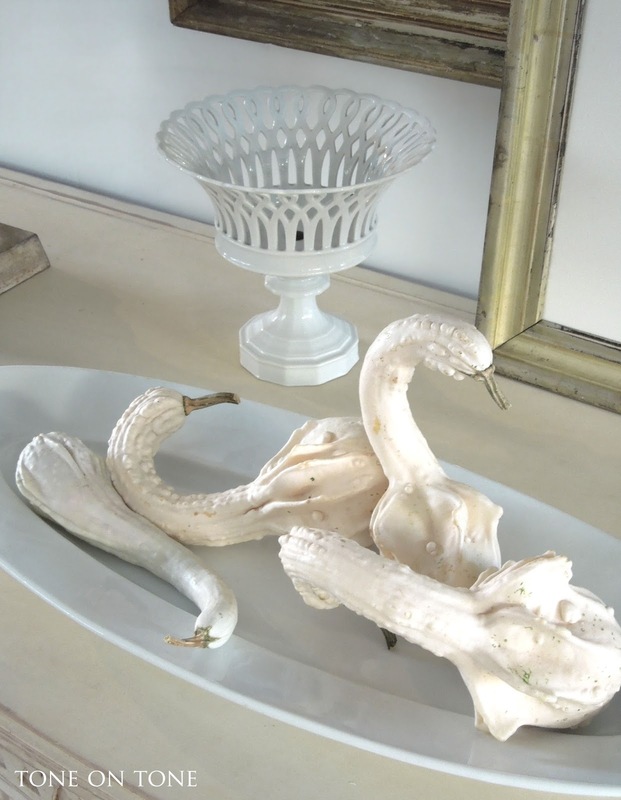 Don't forget about the wide range of gourds available this time of year. When it comes to them, the quirkier the better. And like my pumpkins, I love them light and bright. 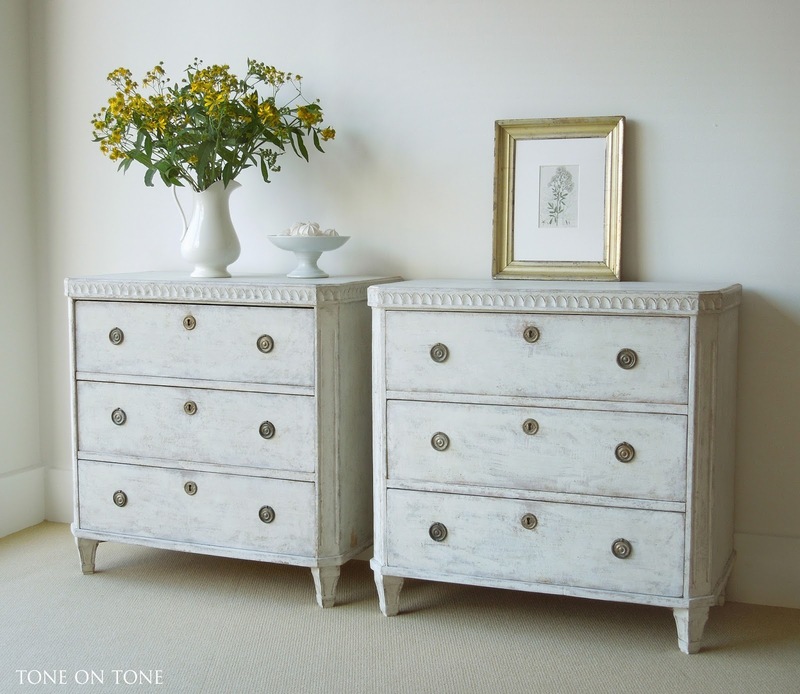 A lighter shade of pale! 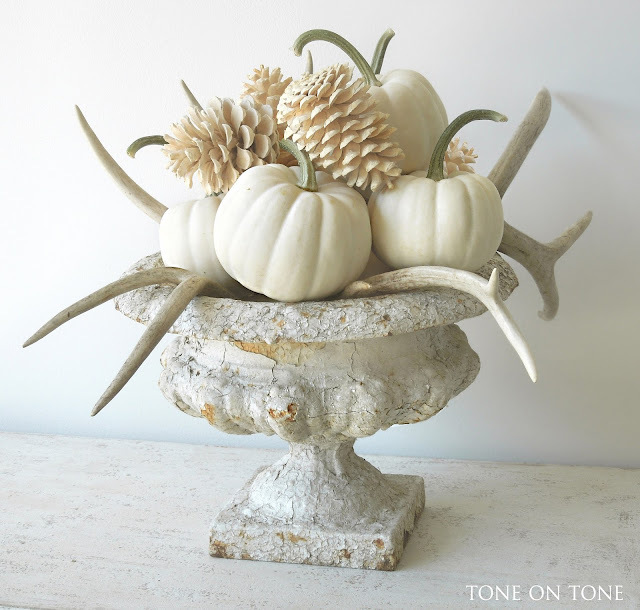 Last season I created this white fall centerpiece with simple gatherings from nature. I had no idea it would become so popular. It went viral with over a million pins on Pinterest plus endless reposts on Instagram. Elle Decor, House Beautiful, Country Living and numerous blogs all featured it online. Many, many thanks to everyone for sharing it! !